Vivekananda Kendra Kanyakumari Rajasthan Prant organised 4 day Sthanik Karyakarta Prashikshan Shibir from 27th September to 1st October 2017 at 3 places namely Jaipur (Jaipur Vibhag), Jodhpur (Jodhpur Vibhag) and Nasirabad (Ajmer and Bhilwara Vibhag). 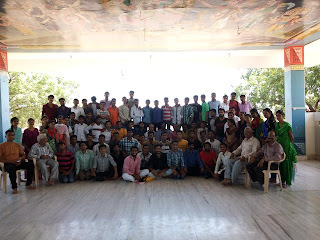 208 select youth from Utho! Jaago!! Yuva Prerana Pratiyogita who are ready to work for Swamiji's call through Vivekananda Kendra participated in the camp. The camp routine was from 4.30 am to 10 pm. After Pratahsmaran Yoga Pratimaan 'Pariksha De Hasate Hasate' was introduced. In different bauddhik satras the topics like Swami Vivekananda's Inspiring Life, Story of Vivekananda Rock Memorial, Vivekananda Kendra, Karyapaddhati, Samarth Bharat and Sajag Yuva were dealt. The manthan was planned to introduce Swadhyaya Varga to the participants. The activities like - Letter to Swami Vivekananda, Group Discussion on Rousing Call to Hindu Nation, Skits on Different national issues and their solution by youth were done in this. In the afternoon sessions different skill development classes were organised like Music, Skits, Photography, Self Defence, Rangolee etc. Participants were free to attend classes according to their choice. Every day, one Prerana Satra was planned wherein students talked with Inspiring personalities through Question - Answer. Different personalities like Swami Samivit Somgiri ji, Athelete Gopal Saini, Social Activist Mahendra Lodha, Sah Prant Sanchalak Bhawani Lal Mathur, Rtd. IAS Shyam Sundar Bissa inspired participants. Everyday Kendra Varga, Bhajan Sandhya and Prerana Se Punarutthan were regular features. Vivekananda Study circles at different colleges are planned as follow up activity along with Kendra Varga.